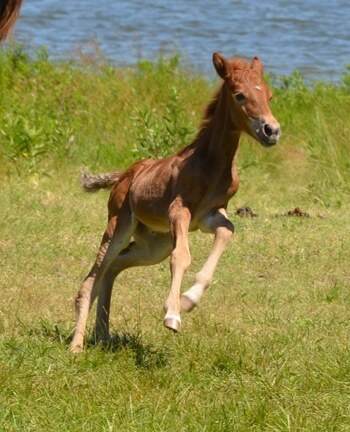 This year four new Assateague foals were born to the Maryland herd on Assateague Island. Let’s take a look at each of these foals, see what they look like, who their moms are, and what their numbers are. The first foal born was a colt. The National Park Service named him N2BHS-O. What kind of name is that? 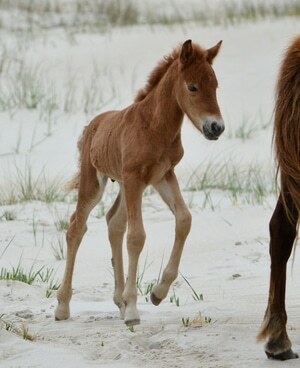 Well, it’s not a name exactly—its a number, a Keiper number, named after researcher Dr. Ronald Keiper who developed a system for naming Assateague foals. First foal of the year, N2BHS-O, with his mom Carol’s Girl. Math Talk – alphanumeric: refers to a combined set of letters of the alphabet and the numbers 0 through 9. Here’s how it works: at birth, each pony is assigned a Keiper number created by adding the letter for its birth year to its mother’s Keiper number. Birth years began in 1976 with A, B for foals born in 1977, C for 1978, up through Z in 2001. At that point the alphabet was started over with a dash in front of the letter, resulting in -A for foals born in 2002. This year’s first foal, N2BHS-O, was born in April to a mare named Carol’s Girl. 1. What is Carol’s Girl’s Keiper number? 2. How old is Carol’s Girl? 3. Which letter in N2BHS-O’s number represents the year his grandmother was born? 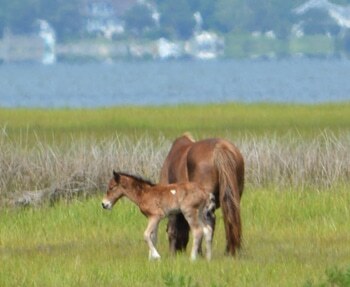 The second of the Assateague foals to be born this year was N6BMT-FO. His mother’s name is Jojo. The new colt was discovered when park staff noticed very clear tiny footprints in the sand. Initially, Jojo was very protective and was seen keeping curious band members at a distance. She soon allowed them to approach and greet the colt, and his education began, learning the full range of equine social behaviours from his mother and all of the other band members including harem stallion, and N6BMT-FO’s sire, General Harker (X16-A). 4. What is Jojo’s Keiper number? 5. In what year was Jojo born? 6. In what year was Jojo’s grandmother born? 7. How old is General Harker? Gokey Go Bones and her new foal. The third foal born this year, a bay colt with a little white spot on the left side of his body, was born to Gokey Go Bones out on the marsh. Gokey Go Bones’s Keiper number is N2BHS-A. 8. What will this new foal’s Keiper number be? 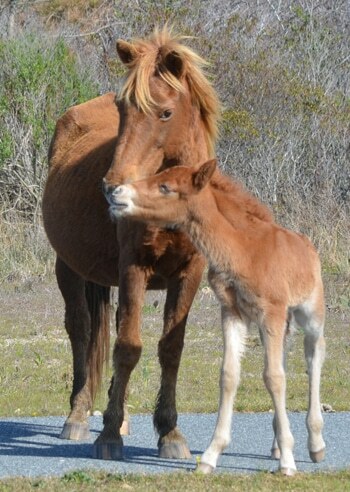 The last of the Assateague foals to be born this year was a sorrel filly with a tiny star on her forehead, named N2BHS-AIO. Her dam is Chama Wingapo. Horse Talk – dam: a horse’s female parent is known as its dam. 9. In what year was Chama Wingapo born? 10. What is the Keiper number for Chama Wingapo’s dam? Have you noticed that each Keiper number begins with a letter followed by a number? What does this letter and number combination tell us? Each of these bands was assigned a letter, either M, N or T. The dominant stallion of each band was given the number 1, so the stallion in band ‘M’ received the Keiper number M1. 11. What were the Keiper numbers given to the other two stallions? 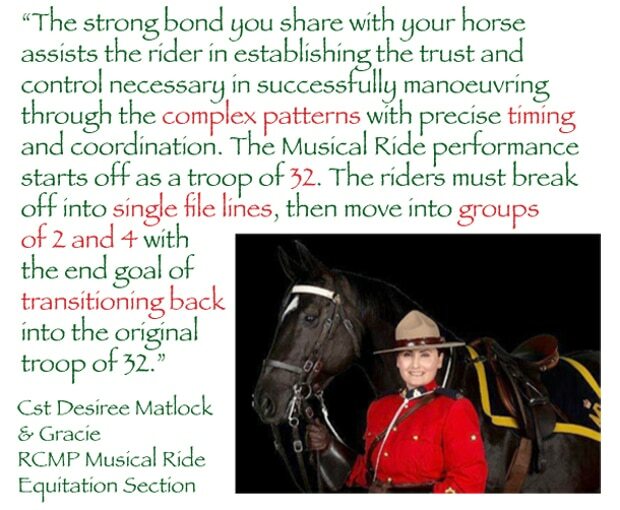 The other horses in each band were numbered consecutively beginning with 2 (M2, M3, N2, N3, T2, etc.). Math Talk – consecutive: numbers which follow each other in order, without gaps, from smallest to largest. 12. How many generations are shown in the new filly’s Keiper number? 13. What is the Keiper number for the first mare in the new filly’s ancestory? As mentioned above, in 2002, the alphabet began repeating itself, this time with a dash in front of each letter. 14. In what year will the alphabet begin repeating itself again? How many foals will be born next year? We’ll have to wait and see! Step 1: The last letter in Carol’s Girl’s Keiper number represents the year she was born, 1994. Step 2: 2016 − 1994 = 22. Carol’s Girl is 22-years-old. Answer: 2016 − 2002 = 14. General Harker is 14-years-old. Answer: N2, B, H, S, -A, -I, -O: 7 generations. 13. What is the Keiper number for the first mare in the new filly’s ancestry? Answer: ‘P’ is the 16th letter in the alphabet. Ten more letters remain. The year 2017 is designated by ‘-P’; 2017 + 10 = 2027. ‘-Z’ will represent 2027. Therefore the next year, 2028, the alphabet will begin repeating itself again.